Spotted jewelweed (Impatiens capensis) of the Touch-Me-Not or Balsam (Balsaminaceae) Family is a tall annual found in wet soils. In the US, it occurs throughout the eastern half of the country and also in the Pacific Northwest. 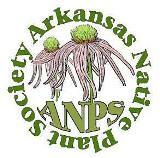 The species occurs throughout Arkansas, in areas of partial shade with consistently wet to boggy soils, such as overflow areas of streams and ditches, bottomlands or low areas kept wet by groundwater. It is also known as spotted touch-me-not, orange jewelweed, orange tough-me-not and orange balsam. 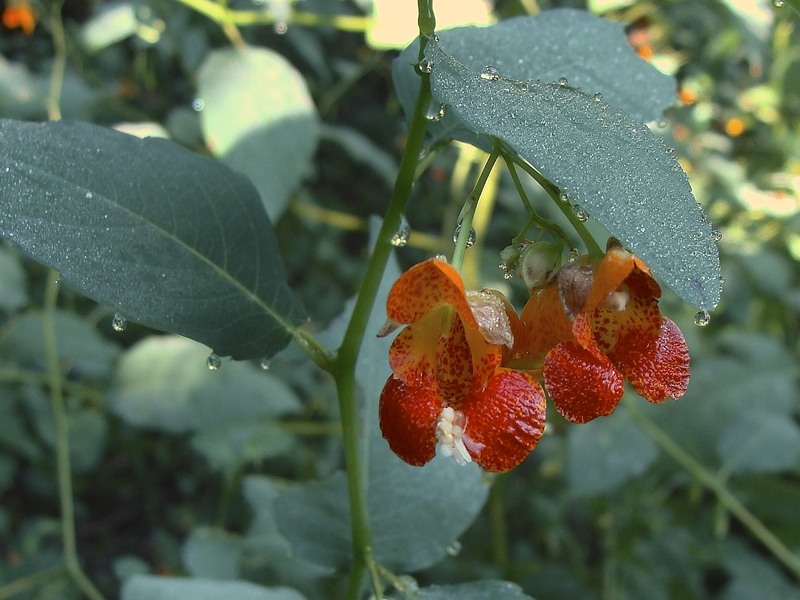 The name “jewelweed” may relate to the beading of water on its leaves. The name “touch-me-not” relates to mature seed capsules “exploding” upon touch, expelling seeds in all directions. The specific epithet means “of the cape” based on Cape of Good Hope in Africa (this plant was mistakenly thought to be native there). Photo 1: Spotted jewelweed during its early growth. In favorable sites, dense colonies may form so that most leaves and flowers are found at the upper portion of the plant. In such colonies, plants may reach 6 feet tall and have few branches. In more open areas, plants are shorter and have more branches. Pale green, round stems have swollen nodes (the largest nodes lower on stalk) from which leaves and lateral stems grow. Stems are typically hollow except at nodes which are filled with a gelatinous material. Lower stems have opposite leaves while upper stems have alternate leaves. Plants are glabrous. Upper stems are zigzag from leaf to leaf. Stems break easily at nodes. Roots are shallow and of limited extent. Leaves, up to 5 inches long and 2½ inches across, are ovate to elliptic, flat and thin with shallow, rounded teeth along their margins. Teeth are angled toward the tip and widely spaced. 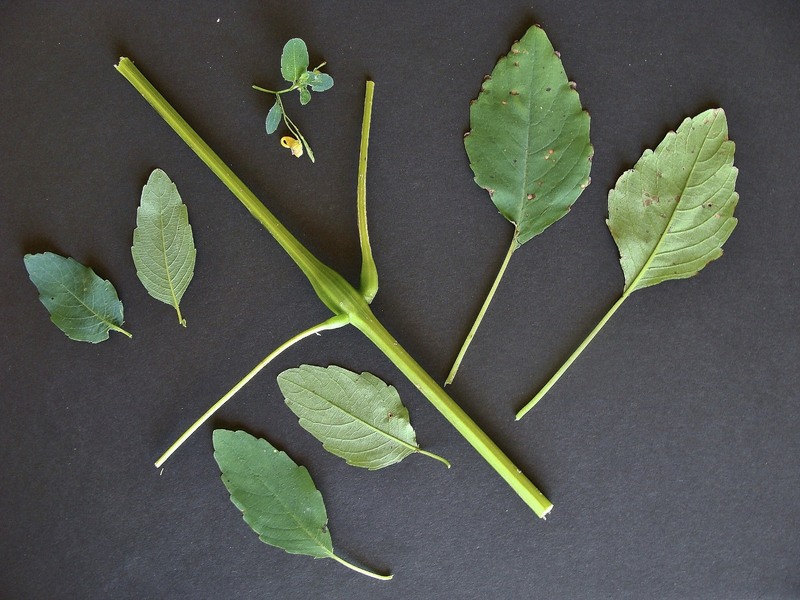 Leaves have a dull dark green upper surface and a dull light green lower surface. The tip of a leaf has a shape similar to that of the marginal teeth. Petioles, up to 2½ inches long, are slender. Leaf venation is pinnate, with main veins meeting the midrib directly opposite or offset from each other. Leaves resist wetting so that beads of water from transpiration, dew or rain form on leaf surfaces. Photo 2: Mature jewelweed plants have stout stems with obvious bulges at nodes. Upper and lower leaf surfaces shown. Note pinnate venation. Spotted jewelweed blooms over several months in summer as the plant continues to produce new growth at stem tips. The inflorescence consists of a small cluster of flowers dangling from weak peduncles that grow from almost all leaf axils. Peduncles may have up to four or more loosely held flowers, each on its own pedicel. Flowers, held in a horizontal position, dangle lower than the leaf axils from which they grow. Flowers, golden orange with spots and splotches of reddish brown on interior surfaces, are about 1¼ inches long by ½ inch wide, and structurally very complicated. They have two small, rounded sepals which are light yellow to orange on their interior surface. A larger, third sepal is elaborated into an inflated orange conical structure, ¾ inch long, terminating in a curved and twisted nectar spur. Flowers have five petals; the prominent upper lip, two prominent lower petals along with small flange-like petals attached to the prominent lower petals. The upper lip petal has a green “keel” along its outer center. A tight cluster of five stamens with white filaments and pollen grasps the style immediately below the stigma. The stamen cluster falls off shortly after the flower opens, exposing the stigma to fertilization by other flowers. Each flower is subtended by a very small bract. Photo 3: The “keel” of upper petal is green when in bloom due to that portion being exposed to light while in bud (white arrow). Sepals, also with “keels,” and the nectar spur can also be seen. Photo 4: In the left flower, the cluster of stamens has fallen from the pistil and was caught by the two lower petals. Two small flange-like petals can be seen attached to the two lower petals. Smaller sepals (light color) can be seen behind the upper petal. Photo 5: White arrow indicates a natural gap in the structure of the larger, nectar-bearing sepal. “A” shows a separated corolla from back and “B” shows a separated corolla from front. 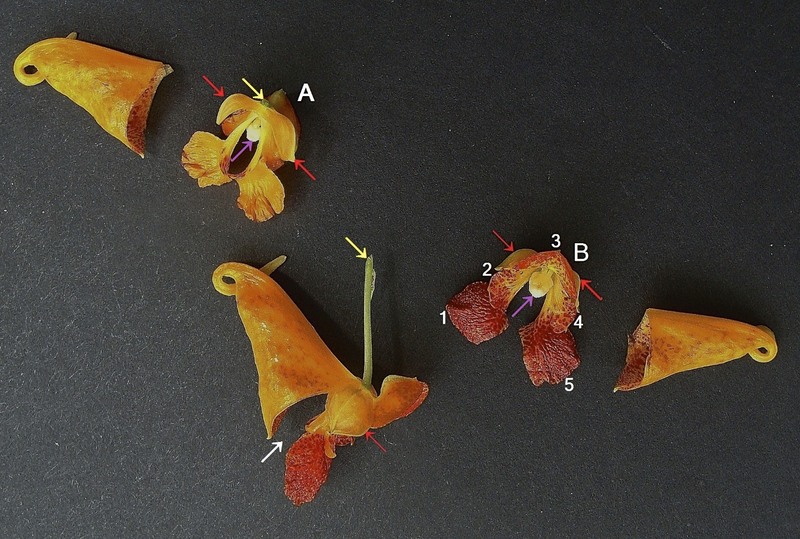 Red arrows indicate smaller sepals. Yellow arrows indicate pedicels. Purple arrows indicate the stamen cluster. Numbers 1-5 indicate the five petals. 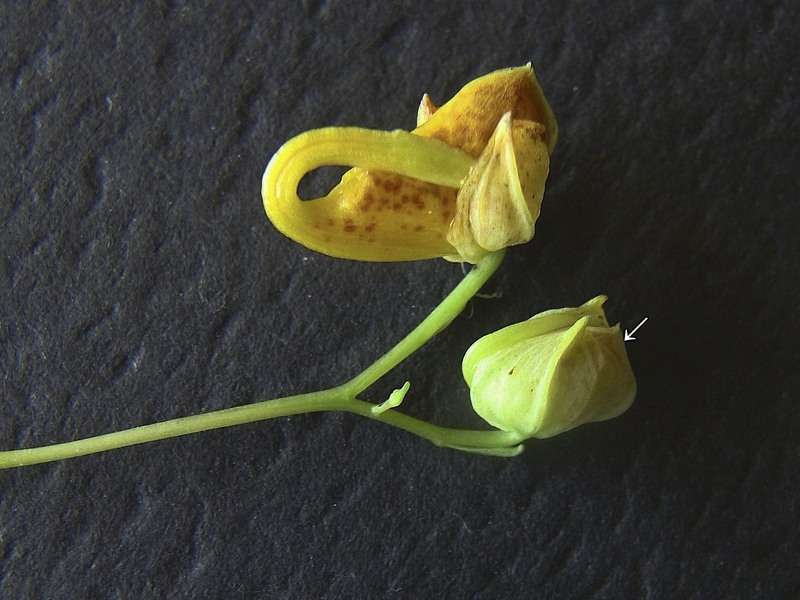 Flowers give way to slender, ribbed, one-inch seed capsules with five chambers. At maturity, and still green, the capsules split (dehisce) explosively with a slight touch by a person, animal or raindrops. 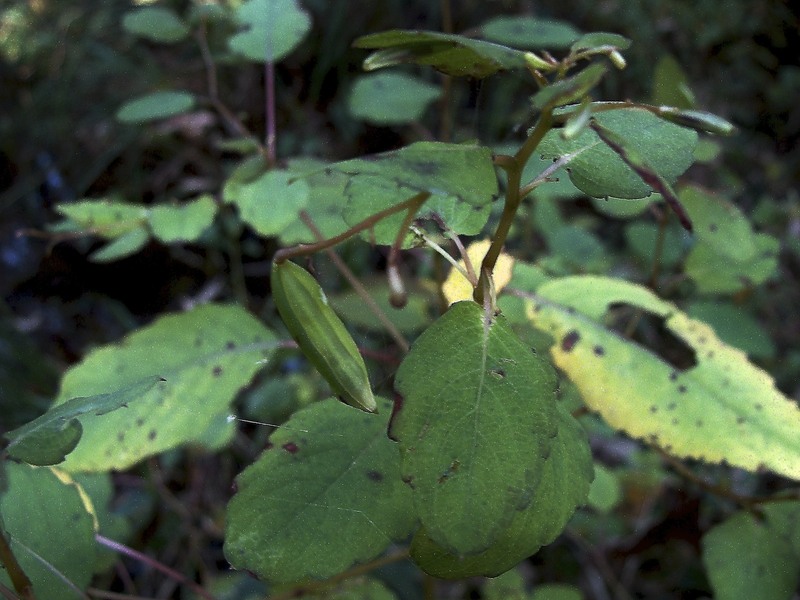 Photo 6: Seed pods of spotted jewelweed mature throughout the summer. Photo taken in early fall. Spotted jewelweed may do well in a bog garden but can be a prolific self-seeder in a favorable site. It is attractive to hummingbirds. Bumblebees take nectar by chewing holes in the spur. 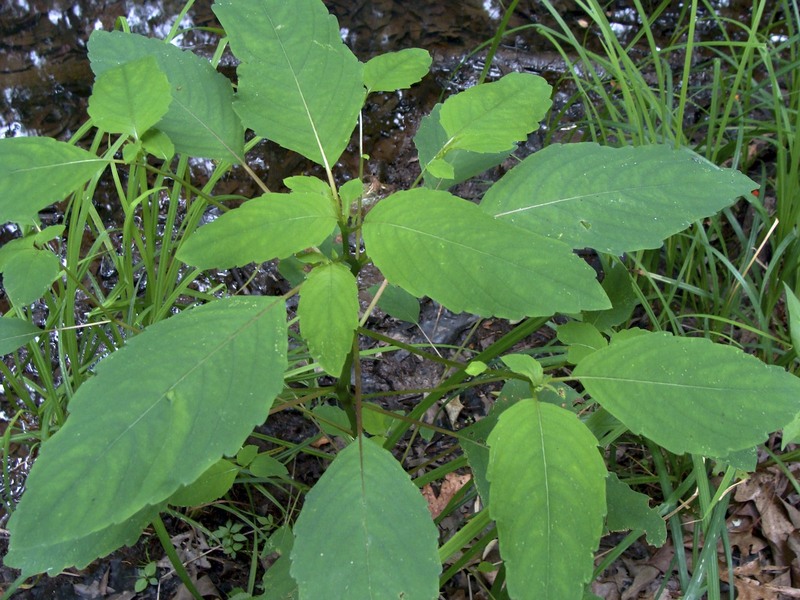 The gelatinous material from stem nodes reportedly provides relief for poison ivy itch and other rashes. Note: Yellow jewelweed (Impatiens pallida), also called yellow touch-me-not, pale jewelweed and pale touch-me-not, with its yellow flowers with much more subdued reddish-orange spotting internally, is found in northern counties of Arkansas. This entry was posted in Know Your Natives, Native Plants, Wildflowers and tagged Balsaminaceae, Impatiens, Impatiens capensis, Jewel Weed, Know Your Natives. Bookmark the permalink.